Battlefront is rough to play now, and was pretty rough back then too, depending on the platform you played it on I suspect. 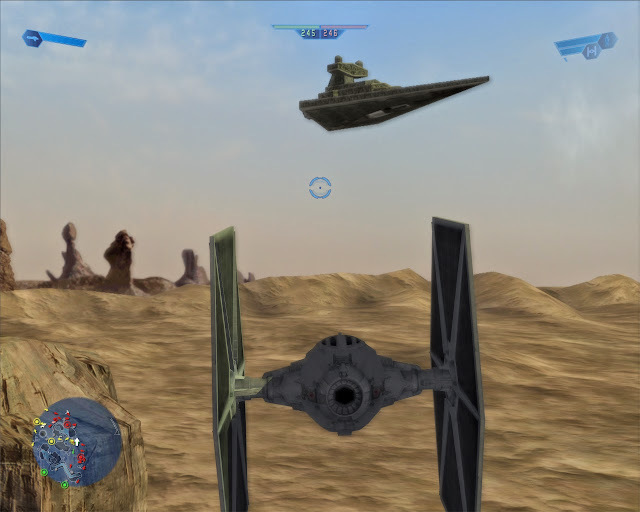 Battlefront is a multiplayer-focused shooter, playable in first or third person perspectives, featuring some large open maps and range of vehicles. While there are a few different single player modes, they are simply AI-controlled bot matches. I predominately played on the PlayStation 2, though more recently the PC version. On the PlayStation 2, Battlefront skill really comes down to how well you can lead your ridiculously slow moving blaster shots, and how quickly you can sidestep the ponderous AI. The PC version has a little of that, but a solid frame rate and a precise means of lining up your shots reduces the level of challenge to that of a shooting gallery. The AI bots are genuinely awful, they are quick to jump on a turret if one is on hand, but will not reliably seek out targets, or move out of the way of enemy fire. They also have an unhealthy fascination with grenades – it really gives Call of Duty: World at War a run for its money. A Clone sniper on Kamino. Battles take place in both the prequel and original movie timelines, on mostly the same maps, with a few key planets, like Endor and Geonosis restricted to the Galactic Civil War and Clone Wars timelines respectively. Each of the four factions has a selection of five classes; a rifleman (the basic medium-range soldier), sniper, pilot, a heavy (anti-vehicle) soldier, and a fifth faction-specific class. When playing with a DualShock 2, the sniper class is best avoided in my experience, though on the PC, with the benefit of mouse aim it proves a dominant choice. The faction-specific classes are the most interesting; the Rebels have the hardy Wookie class, for example, but the CIS boasts the devastating destroyer droid (Droideka). This rolling ball of death wields rapid firing blasters that can clear a room in seconds, and a steadfast shield, capable of withstanding multiple direct rocket strikes. Their only states of weakness are during movement, when they are rolling, or when the shield is recharging, these mechanical beasts are true murder in the ice tunnels of Rhen Var. The map selection is well varied with a pleasant mixture of smaller, denser arenas, as well as larger maps that support vehicle combat. Each planet that was not a considered a faction-capital had two maps, one small, one large. 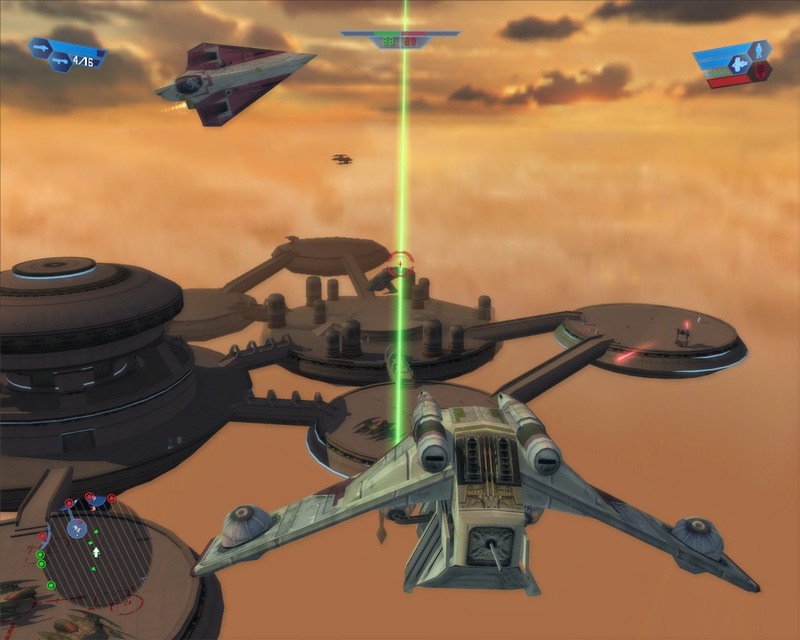 One Bespin map, is a series of floating platforms, linked by long, cover-starved tunnels, surrounded by a sky of dogfighting aircraft. 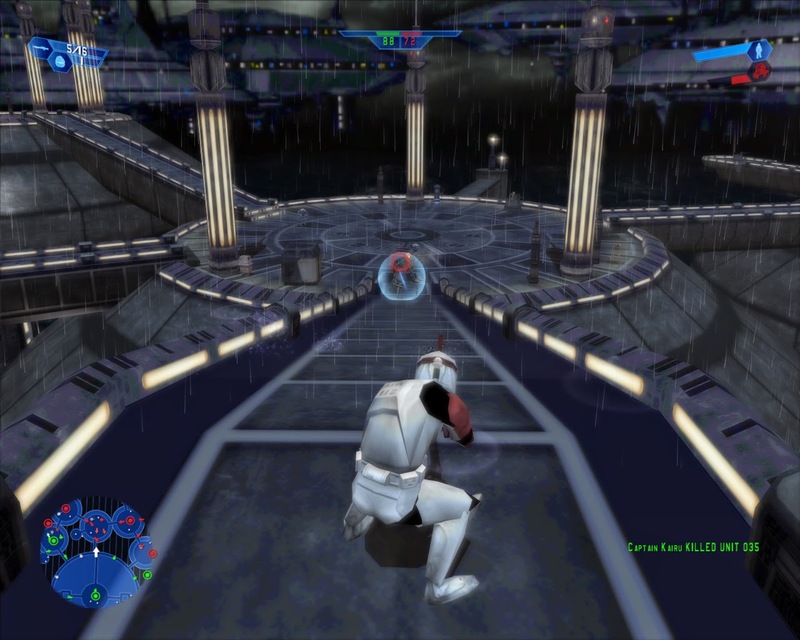 The second Bespin map, is set in the streets of Cloud City itself, and focused entirely on infantry combat. 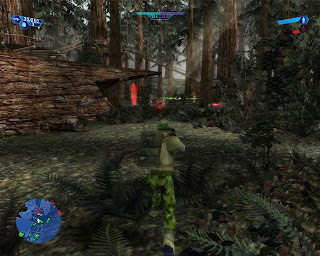 Jungle planets, like Yavin and Endor, prove more difficult to play, especially on the PlayStation 2, which already covers the screen with a film of low resolution blur. The camouflaged Rebels (and brown Wookies) have a distinct advantage over the stark white Stormtroopers – and don’t even get me started on the Ewoks. That isn’t quite the same on the snow planets; because the Rebels are fortunate enough to receive a palette swap (damn you Lucas), nullifying any such Imperial advantage. The whole Battlefront series is one built upon base-capturing repetition (perhaps it also explains my insatiable hunger for the Dynasty Warriors games?). 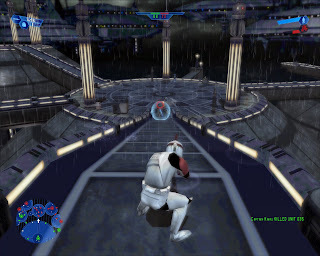 The campaign largely follows the arc of the Star Wars movies, using the same maps and base-capturing objectives as the multiplayer. However, missions are punctuated by a few savagely compressed full motion video clips pulled from the movies. Galactic Conquest is a very basic, turned-based gamemode that incorporates planetary bonuses into the core combat. These bonuses can have a pretty profound effect on the course of a battle, for example; enemy vehicles spawn heavily damaged if Sabotage is used, or a lightsaber-swinging, AI-controlled hero (or villain) can be called in with the Hero bonus. It should be noted that like all the AI enemies in Battlefront, heroes are wonderfully stupid, but they are robust and capable of deflecting just about anything. Regardless of how the game frames itself, the gameplay and maps remain the same throughout the gamemodes, as a child this did little to deter me, even though I never experienced more than spiltscreen multiplayer. Now though, modern games have spoiled me; the lack of any kind of progression or gameplay depth ensures that after a few battles I’m ready to move on. Battlefront is still enjoyable don’t get me wrong, but age has done its rough edges few favours. One hopes that Battlefront II holds up a little better – check back soon!